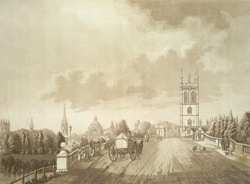 View of a street approaching Oxford, showing townspeople, students, a horse drawn vehicle and the famous skyline. In the 1720s, Daniel Defoe wrote of Oxford as "a noble flourishing city" located in a "delightful plain, on the bank of a fine navigable river, in a a plentiful country". Travelogue author, Celia Fiennes visited the city in the 1690s, commenting: "Its situation is fine on a round hill, environ'd round with hills adorn'd with Woods and Enclosures." She described the town as "pleasant and compact" and noted that "the Theater stands the highest of all [buildings]" in a skyline "whose towers and spires appeares very well at a distance".